I had a sudden memory pop into my head today from a childhood summer and realised one of the ways in which my childhood was very different to the boys. It was always an exciting treat to have a paddling pool out in the garden or the chance to play in the sprinkler as it watered the grass, I had a slide in the garden that was also sometimes put into the pool which was even better! The actual memory which surfaced however was how cold the water was, I suddenly had a flashback to a lovely hot summer's day, but icy cold water going to the pool. I remember the pool being in the bit of the garden that got the most sun, and my Mum filling the pool in the morning so it would be warm with the heat of the sun for the afternoon. I think she even used to add hot water to get it warmer for me to play in! 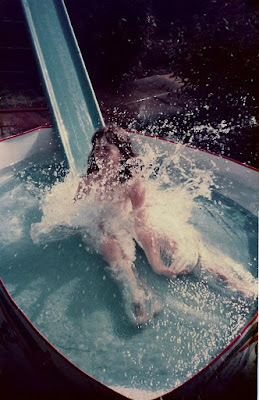 I loved playing in the sprinkler and remember screaming with laughter as the cold water hit me, playing in it until the grass got too muddy and it was turned off. Kids seem to have a certain immunity when it comes to water temperature, distracted by playing they will happily be in much colder water than an adult would be so the fact that I remember it as cold must tell you something. You may be wondering why exactly this memory popped into my head today, well I'm sitting writing this on the balcony while Louka plays in his paddling pool. As I started to fill the pool for him I told him he could get in if he held the hose on the ground and kept it under the water as it filled up. I turned around to move the chair cushions out of the way and suddenly got soaked, with a shout I moved to see the hose out of the pool and snaking all over the balcony spraying everything! It was a fair comment (it made me recoil as it hit me!) and he was ever so cute and apologetic saying 'Sorry Mummy for making you wet' after all he had no idea what would happen when he put it down. I told him it wasn't a problem and it had just made me jump! He got back in to wait for it to fill and said 'But Mummy, I want the water to be refreshing'. I was hoping the water would cool the longer it ran but I was being a little optimistic. After a while it did stop being TOO hot to sit in but never really got to a temperature that could be classed as 'refreshing'. I would never have imagined that cold water would be so hard to come by at this time of year. Actual cold water is a distant memory for us during the summer in Cyprus. To have a shower you get approximately 5 seconds of cold water before it becomes to hot to stand under, you then move the tap to 'Hot' where you get another few seconds of actual cold before moving it back to cold to continue your shower in very warm water! Cleaning your teeth in warm water is also a very strange and slightly annoying experience. A few years ago we were at a friends house about to get in her above ground pool. She took the cover off only to discover it was far too hot for even the adults to get into! A slight bit of difference to my childhood days! I wonder what my boys would make of an English summer? If you can't get cold water from the tap - have an outside bath!